The semi-rural location, spaciousness of the properties and superb specification offered by Elan Homes has contributed to the success of the intimate development. Now with just two homes available, time is running out for would-be homeowners. But what they may not realise is that obtaining one of the last luxurious properties could be easier than they anticipated. Elan is offering to tailor make move-making incentives to buyers’ needs, plus the home are eligible for the Government’s Help to Buy equity loan scheme. Exclusive to new build homes, priced up to £600,000, it’s open to first time buyers and those making their next move on the housing ladder, providing they’ve sold their previous property subject to contract. Using the scheme, one of the last homes at The Hawthorns could be secured with a relatively small deposit of 5%, plus a mortgage of 75% from the purchaser’s chosen lender. The remaining 20% is covered by the equity loan, which is interest free for five years. If that wasn’t enough, on selected properties only, Elan is offering to pay £5,000 towards the cost of Stamp Duty, plus will also include carpets and turf to rear garden in the price. 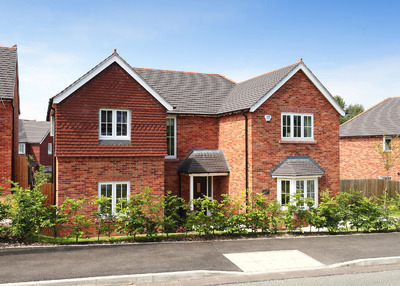 The final homes at The Hawthorns are both five-bedroom detached designs, priced from £539,995 to £599,995. Both the Chesham and Faversham styles feature convivial layouts which put the open plan kitchen, breakfast area and family room at the heart of family living. They also feature separate lounge and formal dining room, with a cloakroom and utility completing the ground floor. Upstairs, both properties include two en-suites to supplement the family bathroom, with the master bedroom in the Faversham also featuring a dressing room. Situated off Common Lane, the new homes at The Hawthorns will enjoy green and pleasant surroundings accessed via a leafy road lined with oak trees and hawthorns. Despite the leafy setting, homeowners will be able to make the most of a wealth of amenities in the surrounding area including the shops, bars and restaurants of Holmes Chapel, Northwich and Knutsford. The Faversham show home at The Hawthorns is open Thursday to Monday from 10am to 5pm. For more information, see elan-homes.co.uk/developments/the-hawthorns.